A Chronic Kidney Disease patient currently conducting Dialysis emailed the KidneyBuzz.com Team and asked, "None of my doctors have been willing to give me a clearance to dive with my AV Fistula. I have asked my Nephrologist, my GP and my physical rehab doctor, and none of them are willing to say it's OK to dive with it, but can't tell me that I can't dive with it. They just don't know how diving would affect it. I can't say that I would quit diving if they told me I couldn't dive with it, but I would appreciate knowing the risks that are involved if I continue to dive. Any insights?" Be Careful Of Pressure: For Dialysis patients, it is very hard to tell what impacts scuba diving and other deepwater activities can do to the body. However, patients should recognize that going deep into the ocean can lead to a build-up of pressure which could possibly impact the AV Fistula. Too much pressure on the Dialysis Arm can lead to damage and failure. Also, large amounts of pressure can exhaust a Dialysis patient who may not have as much stamina as the average diver. Hence, try not to push yourself beyond your limits because it could put a patient in serious danger. Try To Avoid Hard Impacts: When suffering, jet skiing, or playing around in the water, try to avoid hard impacts - especially with your Dialysis Arm. Several heavy collisions with your arm and the water can cause it to be disrupted and become less effective over time. Wetsuits Can Be Too Tight: Whether you are surfing, scuba diving, or just trying to avoid cold water temperatures, wearing a wetsuit may be a big 'no-no.' 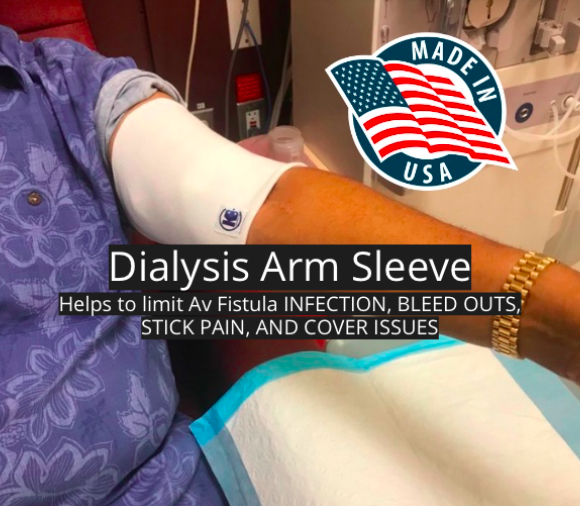 Instead, you may need to wrap your AV Fistula or Peritoneal Dialysis exit site because wearing a wetsuit that is constricting (rigid) could stop the flow of blood and result in clotting or failure of the preferred Dialysis Access. Be On The Look Out: If you choose to go for a swim, make sure to wrap your arm and change the dressing immediately so that germs do not fester - leading to increased risk of infection. Remember that once you remove the dressing then wash your exit site and/or safely shower after swimming. What's more, constantly monitor your Dialysis Access for any redness or signs of irritation which may be early indicators of an infection that you will want to address as soon as possible. If you would like some examples of dressing to use when going swimming then feel free to email contact@kidneybuzz.com. Have you ever gone swimming while on Dialysis? If so, what were some of the steps that you took to remain safe? If not, why not? Share your answers with the 71,000 + Friends who have liked KidneyBuzz.com on Facebook (click here). While you are there, like the KidneyBuzz.com Facebook Page and visit KidneyBuzz.com where over (250,000 monthly viewers) regularly come for the latest tailored breaking news and information that teaches those with Chronic Kidney Disease, Dialysis, Kidney Transplant, Diabetes, and High Blood Pressure how to better manage and improve their lives. One of our regular visitors, Robert M. Caldwell stopped by to say, "Stay strong family." We heard Robert and would love to hear from you as well.